The FOX network is understandably very happy with their new Family Guy spin-off, The Cleveland Show. They’ve rewarded it with a very early pick-up. In The Cleveland Show, Peter Griffin’s pal Cleveland Brown (Mike Henry) moves back to his hometown in Virginia to get married. The animated series also stars Sanaa Lathan, Kevin Michael Richardson, Seth MacFarlane, Nia Long, Jason Sudeikis, Seth Green, Arianna Huffington, Alec Sulkin, John Viener, Reagan Gomez-Preston, and Aaron Krebs. When the show premiered on September 27th, FOX had already been treating it like a hit. The show was given a greenlight and a 13 episode order in May 2008. 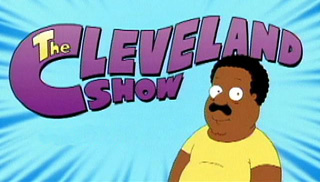 Needing ample time to produce the animation, Cleveland was expected to debut by mid-season 2008-09. Later, based on the strength of what they’d seen, FOX decided to delay Cleveland’s premiere and give it a big launch in Fall 2009. They had such faith that they renewed it for a second year in May, several months before its scheduled premiere. So, while some new shows are still hoping to get through their first season, fans of The Cleveland Show can rest easy. They’ll be seeing new episodes of Cleveland for a long time to come. What do you think? Is Cleveland worth watching? 2.family guy has a little sense of humor and cleveland is totaly blown off. It’s brilliant! Family Guy and Cleveland Show have the same sense of humour but they are different shows. We love it in the UK!